Peugeot 2008 is taking on an even more assertive, powerful and appealing SUV design. Its wheel arch extensions (from allure level), new vertical front grille and scuff plates (from allure level) confirm its robustness, designed for everyday use. 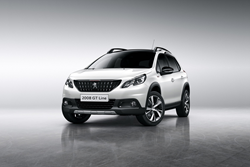 Peugeot 2008 is now taking on an even more assertive, powerful and appealing SUV design. Its wheel arch extensions (from allure level), new vertical front grille and scuff plates (from allure level) confirm its robustness, designed for everyday use. Grip control - an adapted traction system - gives the 2008 its versatility on all types of terrain. It is combined with mud & snow (all-season) certified winter tyres. Peugeot 2008 is equipped with Mirror Screen, based on MirrorLinktm and Apple CarPlay®, along with the reversing camera, Active City Brake and Park Assist - a rarity in this segment. An unparalleled dynamic performance is apparent in all versions. The euro6 engines ensure high-level driving pleasure while remaining fuel efficient. Four versions are best-in-class in their segment, including the 1.2l PureTech 130 S&S bvm6. The UK range is composed of euro 6 PureTech and BlueHDi engines, in manual and automatic. Offering power ratings of 82 to 130hp, its co2 emissions are restricted from 96 to 114g/km. The Blued engines comply with the euro 6 standard through the exclusive combination of the SCR technology and the additivated DPF, the most effective technology on the market. Four types of engine are ‘best-in-class’ in their segment, including the new 1.2l PureTech 130 S&S bvm6. This versatile 3-cylinder engine can be combined with three transmission choices: 5-speed manual gearbox, 6-speed manual gearbox or 6-speed automatic gearbox. This is the new automatic gearbox called EAT6 for efficient automatic transmission 6-speed. Its Quickshift technology guarantees top-of-the-range driving pleasure due to its design to increase fluid transfer for rapid gear changes. Moreover, its co2 emissions are considerably reduced as a result of the reduction in internal friction and internal slippage due to the lock-up torque converters (securing a direct-drive when cruising). The Blued 1.6l Diesel engine is a combination of the selective catalytic reduction (SCR) technology and additivated diesel particulate filter (DPF). This engine is characterised by its pleasure to drive and record low fuel consumption, regardless of the version – 75hp, 100hp and 120hp. 1.6l Blued 120 S&S, 6-speed manual, 76.3 mpg, with co2 at 96gco2/km – best-in-class.